Incredibly, approximately 60% of the attendees still raise their hands. It sort of makes sense on the surface. Pitchers need strong legs, and pitchers need endurance to get deep into a game. Running long distances gives you strong legs and it gives you endurance. But It’s The Wrong Kind Of Endurance! The most important energy source in your body is called ATP (Adenosine Triphosphate). ATP is the fuel that makes your muscles move. Without ATP, no movement occurs. There are 3 basic energy systems in the human body that produce ATP. 2) Aerobic and anaerobic glycolysis: During glycolysis, the body takes sugars from the blood and converts them through something called the Krebs’s cycle into ATP. This system produces more ATP than the phosphagen system, but it takes about 10-14 seconds to kick in and it expires after about 2 minutes. Anaerobic glycolysis is the only system that produces lactate (or lactic acid) as a byproduct. 3) Oxidative Phosphorylation: This is your long distance energy system. In this system your body uses oxygen from the environment to convert fats to lots of ATP using the electron transport chain. It’s the most productive system. It takes about 2 minutes to get started, but it can last indefinitely. ATP/CP (0-14 seconds) – a thimble full of jet fuel for the intense, short duration events. Glycolysis (14 seconds to 2 minutes) — a mason jar full of unleaded gasoline for the intermediate trips. Oxidative Phosphorylation (2 minutes and beyond)–– a 55-gallon drum of diesel fuel for the long distance journeys. Unless your team is really bad at managing rundowns, the longest pay in baseball is an inside the park homerun, takes about 14-16 seconds to complete, and the only guy who has to run that far is the guy who hit the ball. Everyone else is about 4 seconds or less and a pitch takes about 1.5 seconds. So the only energy system we use in baseball is the first one – the ATP/CP system. Yet we constantly train in the other two systems. That’s why nearly all of our training at The Ranch is done in the ATP/CP system (14 seconds or less). Creating aerobic endurance is of very little value in improving pitching performance. Instead we need to be able to blow up our jet fuel, then reload it in about 20 seconds and blow it up again. The truth is, we do not produce lactic acid when we pitch. That’s not news. We’ve known it since 1992. In a study published in The Journal of Applied Sports Science Research, pitchers showed no increase in blood lactate levels after 7 simulated innings. So the fact is, you don’t have any lactic acid to flush. The irony is that by trying to flush lactic acid, you pass through the energy system that creates lactic acid! For a long time we thought the long distance running was a waste of time. It seemed clear there were a lot more important things to do with that training. Then in 2012 in the Journal Strength and Conditioning Research, they published a Meta analysis examining the question: “If you’re a power athlete, does endurance training decrease your power.” A meta analysis is a big deal. It’s basically a study of all the studies on a particular topic. The most obvious thing about a meta analysis is that there has to have been enough studies done on the topic to merit the attempt. Then you take the statistics from all of those studies and combine them into your own statistical analysis. When you complete a meta analysis, you get what most in the scientific community consider a definitive conclusion. When you train endurance 3 days per week, you lose strength and power!. So not only are poles a waste of time, they are making you worse! And that doesn’t even begin to address the hip mobility issues presented and reinforced by the short stride length demonstrated in long distance running. As an alternative, we should be spending our time working mainly in the ATP/CP system. Flint Wallace, former TCU, and Weatherford College pitching coach and now The Director of Player Development at the Texas Baseball Ranch, brilliantly organized all of his pitcher practices so that every pitcher executed at least 250 explosive movements per day. This could be in the form of a pitch, a medicine ball drill, a plyobox, or whatever. His thought was that if a pitcher could explode and reload 250 times in practice, 120 pitches in a game would be easy. It’s a great formula, and his results speak for themselves. I get that question frequently. You’re going to be tempted to try and convince him. Should you present him with the research? That’s up to you. You know your coach better than I do. If he’s open minded, show him this blog. If not, then don’t bother. Can you imagine this conversation going well? Sprint for 10 seconds, then jog very slowly until you’re back in breath. Being short of breath is a clear indicator that you’re in the wrong energy system. We call it “the talk test.” If you can’t complete a sentence without… taking… a … breath… between… each… word… or phrase… you’re in the wrong energy system. Get back in breath and then sprint again. If the coach calls you out, there’s not much you can do. After all, he makes out the lineup card. If there is no other option, run your poles… then go home and run sprints and work on your hip mobility to make up for it. But the most important way to manage it is to be very, very good. In my experience the better you pitch, the less people care how you got ready to do it.Be so good, they can’t say anything. Then when you’re old and retired you can take up long distance running if you want to. 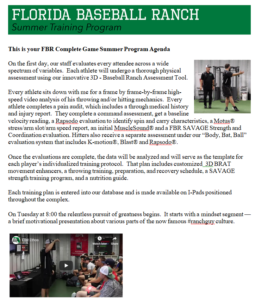 I do understand the idea behind all of this, and I have spent a lot of time thinking about this, researching it and asking a lot of people who are experts in the field of baseball, conditioning and/or baseball conditioning. It may not necessarily help us make a better pitch, but to train and practice on a higher level and to be able to recover from start to start. Thanks for your comments. Your approach seems reasonable. Having a cardio base may be helpful in recovery, but I believe there are better ways to do it than running. I’m not saying you should never train endurance — just not 3 days per week and not with modalities that limit hip mobility.